Sterling Silver 18 inch, 1mm Oxidized Round Box Chain Necklace with Spring Ring. Darkness will vary. It’s In The Box! We all have this love affair with Boxed things! Boxed lunches! Boxed Christmas Cards. Puppies in Boxes. Sparkly surprises in Jewelry Boxes! At Halstead, we have the 211X18 – our Oxidized Antiqued Sterling Silver 1mm Box Chain with Spring Ring. 18-Inch Finished. 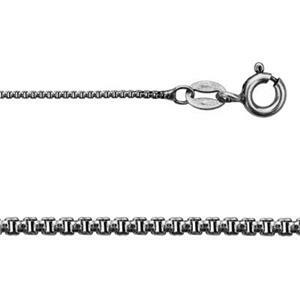 This is a sturdy, finger-smooth chain with a sleek, classy appearance. Adorn your necklace with one of our Sterling Silver Charms. Notes: Oxidized finish. Oxidation darkness will vary between lots and is not considered a defect.